Is Google going to develop a Facebook-like social network of its own? Rumours that Google is set to launch a Facebook-style social network called "Google Me" have gained traction over the weekend. "Ok, umm, huge rumour: Google to launch facebook competitor very soon "Google Me", very credible source." SF Weekly suggests that "Google Me" is some kind of of upgrade to the already existent Google Profiles, noting that Rick Klau, the developer responsible for Google Buzz, was recently taken on to develop Google Profiles. What with the relative failures of services such as Google Buzz or Google Wave to gain mass traction, is Google testing out a more 'mass market friendly' service? 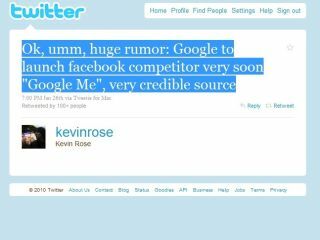 For the time being, this is all still pure rumour and speculation, although the mere fact that the rumour has emerged from Digg founder Kevin Rose is enough to warrant further investigation. We have reached out to Google UK for further background on this story.